In this post we discuss visual management’s role in Lean and Agile management and why investment in visual management software is critical to your success. Consider this. If you were to survey the traditional manufacturing floor, how would you know where the system was breaking down? Sometimes there would be flashing lights indicating a fault in the system, but even if there weren't any, you could still tell which machine was having issues by the big pile of parts in front of it. But when you look around development departments today and a team of knowledge workers, how can you tell where the problems are? Where is the task that is the most critical today? Where is the blockage which is delaying your project today? Where is the one that will delay your project tomorrow? These problems are hidden from view. Visual management was born to solve this problem of ‘invisibility’ of knowledge work. The purpose of visual management is to make knowledge work visible (just like the parts on the factory floor), so we can see it, react to changes better, and keep the project flowing quickly to completion. Visual management is a practice which has primarily evolved in software development projects (kanban), although forms of it appear in Toyota’s Obeya rooms, and many other forms have appeared in many other places. Its primary goal is to make what people are working on visible to the entire team so it can be better managed. 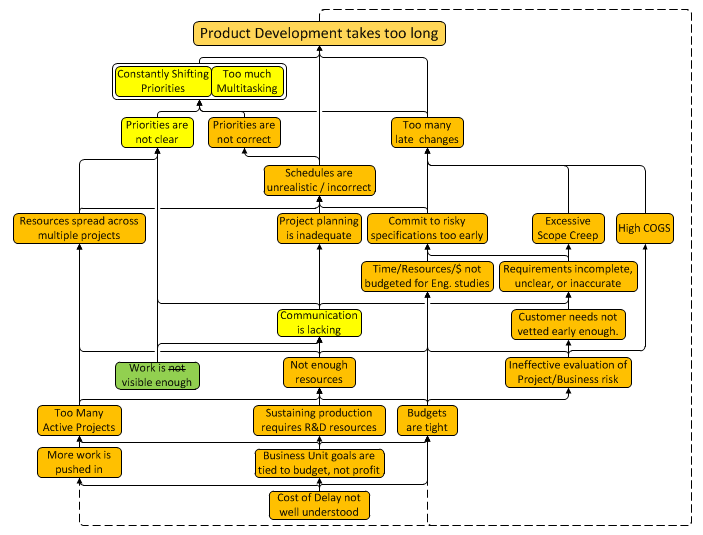 Visual management's early beginnings and subsequent evolution in software project management is significant as the typical versions of visual management are designed to support the unique properties of software development projects and systems, not hardware. The result of the application of this type of visual management to hardware projects is usually slightly faster projects as depicted by the lighter shade of orange in the top issue in Figure 1. With better visual management tools built specifically for hardware teams, we can address a lot more problems and achieve much faster projects. The most common form of visual management consists of sticky notes (stickies) on a white board or similar. The primary formats include Wall Gantts, Generic Kanban boards, and Process-specific Kanban boards. A Wall Gantt is characterized by dates or weeks in the columns, resources in the rows, and tasks of any kind on the stickies. A Process-specific Kanban board has steps of a process as columns and the items going through the process on the stickies (e.g., a new software feature undergoing design, coding, unit testing, and integration steps). In the more advanced cases, there can be any number of different colors, lanes, columns, holding areas, resources, dots, icons, magnets, tag-along stickies, and other aspects that show different information under different conditions. For many reasons, these two formats are used relatively rarely among hardware teams. More common among hardware teams today is a Generic Kanban board. In this format, tasks of any kind go through a very generic ‘process’ from the backlog to in-process, to done. Sometimes there are planning steps or various other high-level stages, when the process is standard enough for those other steps to be part of it regularly. Most digital VWM tools available today use Generic Kanban and/or Process-specific Kanban formats. 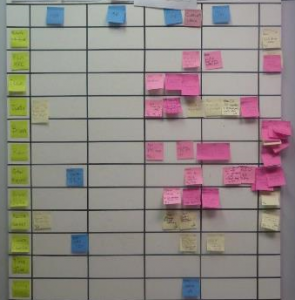 Why don’t process-specific Kanban boards work? It’s best to use an example to highlight the issues of applying software development methods and tools to hardware development. Let’s start with applying a Process-specific Kanban board approach to hardware. Resources in hardware teams typically have a lot of different types of projects to execute simultaneously including new product development, cost reductions, sustaining engineering issues, corrective/preventative actions (CAPAs), and process improvements to name a few. Within each of these, there is a high variety of sub-processes, from mitigating risks, to designing and testing parts, talking to suppliers, etc. Even if we could put each of these into the form of items going through standard processes, it is a different process for each type of item which requires separate boards and makes the work across all of them much more difficult to see. Also, the 'items' in these processes cannot usually be broken down and processed quickly enough to move them to the next step every couple/few days. To make matters worse, the wait time involved (e.g. procurement time) results in many resources having several in-process tasks at any one time. As a result, these boards lose the ability to show blockages well, keep daily priorities clear, reduce multi-tasking, and help keep the work flowing. These are only a few of the many deficiencies of a process-specific Kanban format, but let's move on. Before we developed Playbook, we tried each of these different formats of project boards to accelerate projects. Each form was beneficial in some ways and depending on the application, some more beneficial than others. However, each one had significant deficiencies because, simply put, hardware development project management is more complicated. New visual management systems such as Playbook increase the effectiveness of visual work management in improving new product development systems for hardware development projects. Everyone can clearly see the system at work, team members’ daily priorities, bottlenecks, overloads, multitasking, blockages, and queues. Product development teams can see when the system is overloaded with work, see the impact of delays and understand their costs, effectively evaluate and manage all types of risk, and much more. Ultimately tools and process go hand-in-hand. You need the right tool for the job to support your process. Through the next several posts in this series, we will examine the key underlying principles which drive success in hardware projects, and how the various Visual Work Management tools available today do or don’t enable teams to leverage these principles. In each case, we will review the aspects of our hardware development systems which drive the value of the principle and the methods by which we leverage that principle to achieve success in our projects and profitability in our systems. Do you know the number one reason behind project delays? It's not what you think. Watch this 9-minute video to find out.